As homeless migrants struggle to keep warm in below-freezing temperatures in Paris, police are stealing their blankets and dispersing them with tear gas, Doctors Without Borders (MSF) has warned, accusing officers of "systematic police violence." 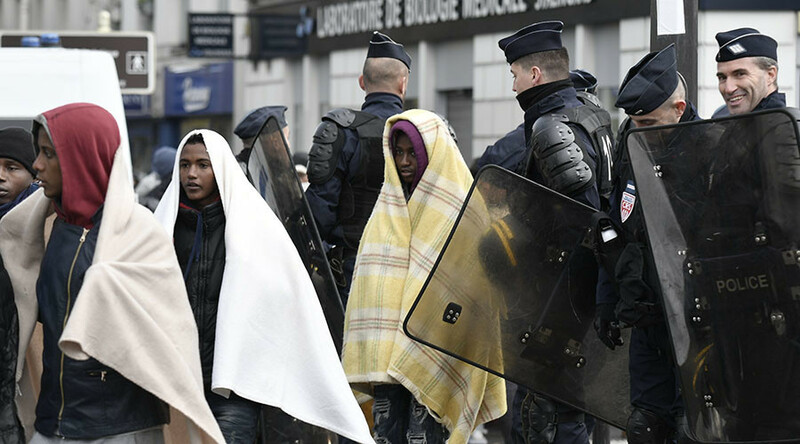 Officers are also waking migrants up in the middle of the night, harassing them, and prohibiting them from sitting down as they queue for a spot in a shelter in the La Chapelle neighborhood, the charity's program coordinator, Corinne Torre, told the Independent on Sunday. “In the heart of winter, public powers should be able to provide shelter for all migrants, as a matter of urgency. Instead, the forces of order confiscate their covers or force them to stay standing in a waiting line for hours, in a ridiculous bid to remove this population in distress from public view. This denial of reality through the use of violence must stop,” Torre said. She went on to state that the organization assisted eight people who had almost reached the point of hypothermia last week. Torre also said the city's sole migrant reception center, opened in November, has been consistently full for the past few weeks, with between 100 and 150 migrants queuing for a spot each day, often sleeping outside for several days before a space becomes available. The center, which cost the French government €6.5 million (US$7 million) has been touted by Paris as a model for others to follow. Its construction came after 30 makeshift camps were cleared in Paris between June 2015 and November 2016. Meanwhile, French Interior Minister Bruno Le Roux has defended the authorities, urging an end to the "national sport of questioning" police work. “I absolutely do not share this vision. What the police force is doing today is providing shelter for vulnerable people,” he said on Sunday.